Phuket is the largest island in Thailand and the natural beauty of Phuket and the surrounding area has resulted in a thriving tourist industry. The 2004 tsunami had a major impact on parts of Phuket, but the island has bounced back and has re-established itself as a favourite destination for Thai and overseas tourists. The beaches and bulk of the accommodation lies on the west coast of the island. Phuket Town towards the south-east of the island is the main urban area with some of the cheapest accommodation. Phuket Town does have regular daytime transport to and from the beaches, but not so at night. Patong Beach is the best known of Phuket’s beaches and the busiest and most developed with plenty of accommodation choices, restaurants, shopping and entertainment. Located 5 miles to the south of Patong, Karon Beach provides another alternative with nightlife and plenty of hotels to choose from. The twin beaches of Kata Yai and Kata Noi (Big Kata and Small Kata) are separated by a small headland and provide a pleasant place to stay whilst Kamala Beach is a good choice if you want a quiet holiday and aren’t too concerned about nightlife. There are some beautiful locations in and around Phuket with trips easy to arrange at any tour office on the island with a day trip to Phang Nga Bay and James Bond Island being one of the most popular day tours. On the island itself, Phuket Town can make for a pleasant break from beach-life and the southern-most tip of the island at Laem Promthep is a popular beauty spot with great sunset views. For a seaside resort, Phuket has all the usual activities you would expect with paragliding, jet-skis and boat trips. Phuket is also a haven for fishing and golf enthusiasts. Most of the beaches have some form of nightlife or entertainment with the most active entertainment scene located in Patong. Tour agents sell tickets to the ever-popular Phuket Fantasea located in Kamala. Transport to and from the venue is included and you get an enjoyable evening of circus-style entertainment. Some airlines and tour operators operate direct international flights to Phuket, avoiding the need to transfer at Bangkok. If you are coming on an internal flight via Bangkok, flights take 1 hour 20 minutes. By road it’s a 12-14 hour bus journey from Bangkok’s Southern Bus Terminal. Although it’s an island, a road bridge connects Phuket with the mainland. There is no train service to Phuket, but you can travel by rail as far as Surat Thani and then take the bus (5-6 hours) across to Phuket. Once you’ve arrived in Phuket, mini-buses from the airport to Phuket Town are approximately 100 Baht per person. To Patong it’s 150 Baht and to Kata and Karon, 180 Baht. Private taxis to Phuket Town start at 400 Baht, Patong 550 Baht, Kata and Karon 650 Baht. In Phuket Town there are plenty of taxis and motorcycle taxis with the minimum taxi fare being 50 Baht. In addition, micro-buses run around Phuket Town for a fare of 10 Baht. To get from the town to the beaches, there are regular daytime buses/songthaews. In the evening a trip from the town to Patong will mean hiring a tuk-tuk and negotiating a fare (at least 220 Baht). 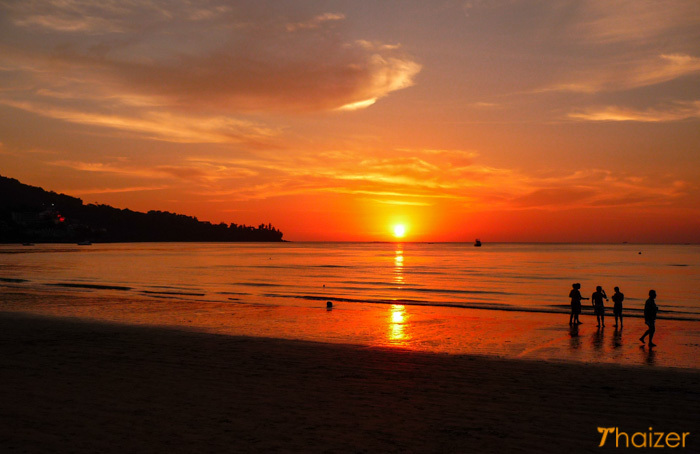 Phuket has two seasons; the hot season from November-April and the rainy season May-October. September and October are the wettest months. November-February heralds the peak tourist trade coinciding with the most comfortable weather and pleasant sea breezes.